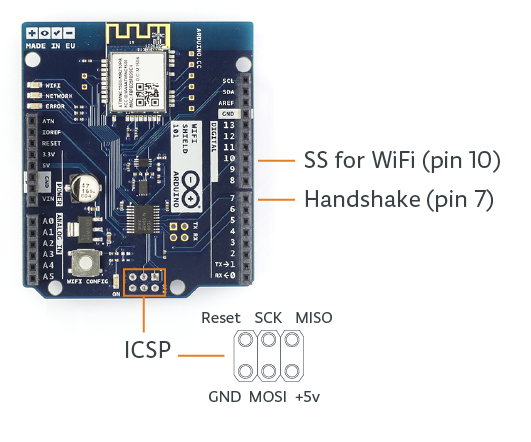 The Arduino WiFi 101 shield allows an Arduino/Genuino board to connect to the internet using the WiFi101 library. The WiFi101 library can be downloaded using the Arduino Library Manager. The WiFI101 library is similar to the Ethernet library and many of the function calls are the same. To use the shield, mount it on top of an Arduino/Genuino board (e.g. the Zero). To upload sketches to the board, connect it to your computer with a USB cable as you normally would. Once the sketch has been uploaded, you can disconnect the board from your computer and power it with an external power supply. The shield will connect to open networks, as well as those using WEP and WPA2 Personal encryption. The shield will not connect to networks using WPA2 Enterprise encryption. The SSID (network name) must be broadcast for the shield to connect. Depending on your wireless router configuration, you need different information. For an open (unencrypted) network, you need the SSID. For networks using WPA/WPA2 Personal encryption, you need the SSID and password. WEP network passwords are hexadecimal strings known as keys. A WEP network can have 4 different keys; each key is assigned a "Key Index" value. For WEP encrypted networks, you need the SSID, the key, and key number. The sketch below is a good one to run the first time you use the board in a new area. This sketch will not connect to a network, but it will show you what networks the shield can view. Your WiFi shield will probably not see as many networks as a computer with a larger WiFi antenna. Once you have downloaded the sketch to your Arduino, open the serial port to see available networks. The sketch below shows you how to initiate a connection with an open network named "yourNetwork". The example below shows how to connect to a WPA/WPA2 Personal encrypted network named "yourNetwork" with a password "12345678". If you do not have access to your router's administrative tools, consult your network administrator. Each key is 10 or 26 hexadecimal digits long (40 or 128 bits) and paired with a key number. For example, a 40-bit key, ABBADEAF01 will work, but ABBADEAF won't work (too short) and ABBAISDEAF won't work (I and S are not hexadecimal characters).vFor 128-bit, you need a string that is 26 characters long. D0D0DEADF00DABBADEAFBEADED will work because it's 26 characters, all in the 0-9, A-F range. The example below shows how to connect to a WEP encrypted network named "yourNetwork" with a hex key of "ABBADEAF01", and a key index of 0. Arduino communicates with the shield using the SPI bus. This is on digital pins 11, 12, and 13 on the Uno and pins 50, 51, and 52 on the Mega. On both boards, pin 10 is used as SS. On the Mega, the hardware SS pin, 53, is not used, but it must be kept as an output or the SPI interface won't work. 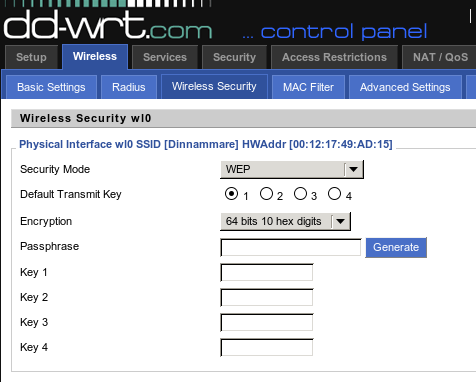 Refer to the WiFi 101 library page for more information on the functionality of the shield, as well as further examples.